So I’m running through Bowerstone market having just rescued some slaves from captivity, and I’m feeling pretty awesome and heroic. A villager yells at me as I pass him: “Hey! Where are you going fatty?” I stop running and I turn around, shocked. Did the game just call me fat? Later I’m alone in my house and I unequip all of my clothes. 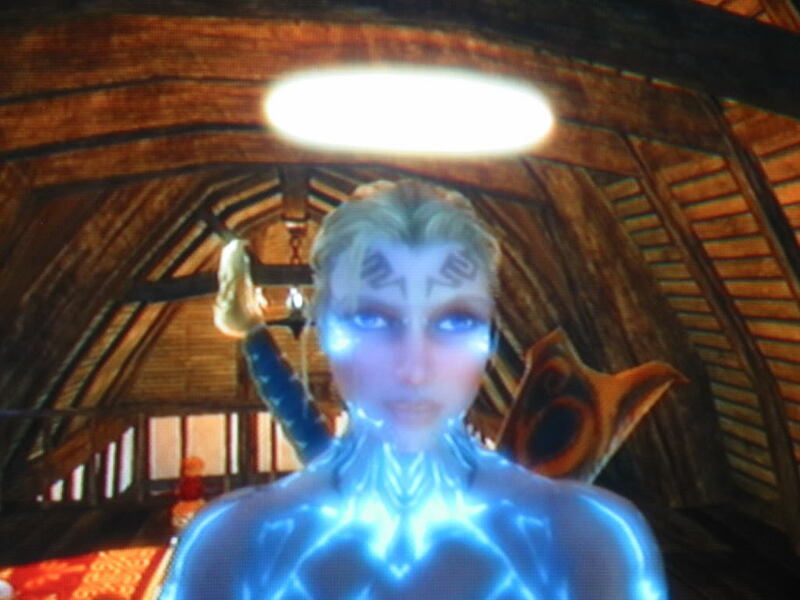 I examine my character’s body, positioning the camera so that I can get a good look at myself. Wow, I really have put on some weight, I think. Must have been all of those pies. In almost all video games, the body that you begin with is the body that you end with. This is not so in Fable II. Since your digital body is constantly in flux, you are often reminded of the presence of your real, physical body. 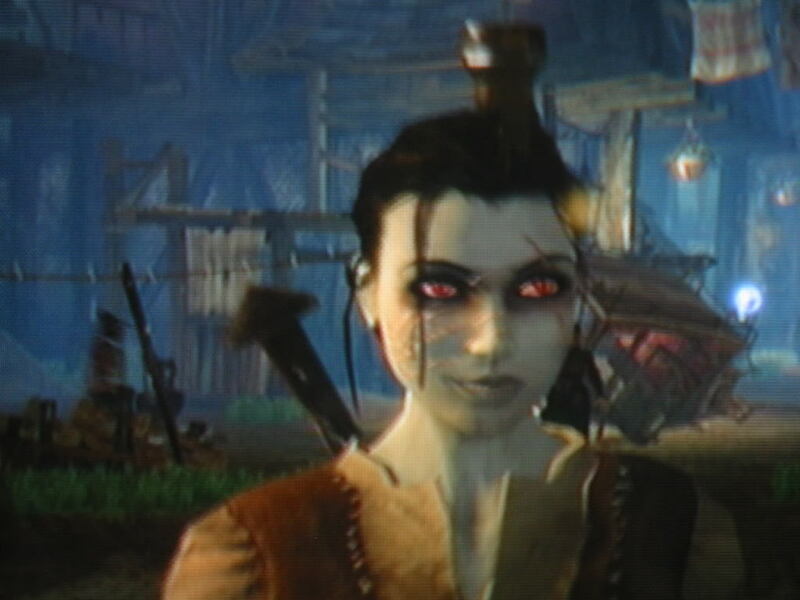 While I was playing Fable II I came to identify with my avatar’s body to a greater degree than I would with most games, and this was because I was continually aware of my onscreen and offscreen bodies. I had a moment where I felt like the “hey fatty” comment was directed at me the player. It was jarring and uncomfortable. Even more problematic than the way weight is handled, however, is the character morphing system. For those who aren’t familiar with the game, character morphing is Lionhead’s alternative to a character creation mechanic. When the game begins, you are only given one choice: male or female. You are given a generic body. As the game progresses, though, your character‘s appearance changes based on his or her alignment. Alignment is based on your actions and rated on two scales: good versus evil and corrupt versus pure. 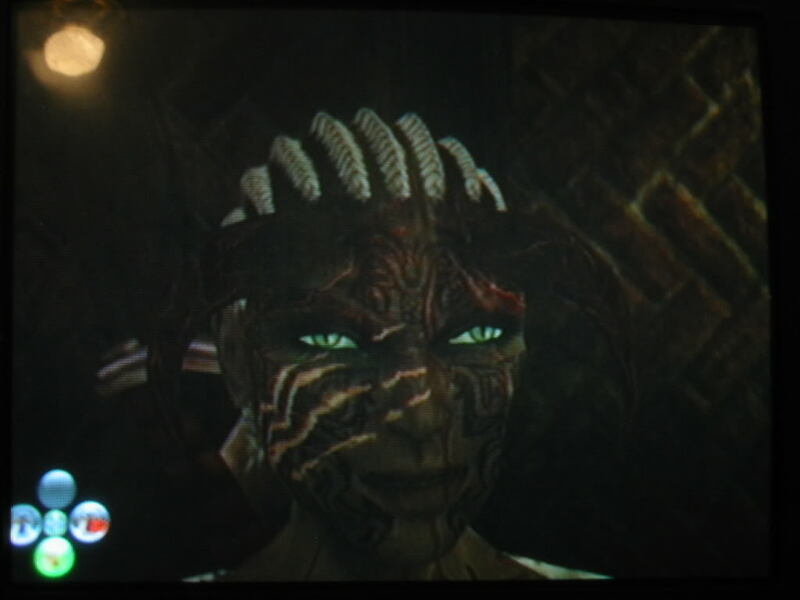 An evil, corrupt character will have brown skin, bright red scars, prominent horns and green eyes. A good, pure character will have a light complexion, glowing teeth, blue eyes, blonde hair and a halo. These are the two extremes. Combining different levels of corruption and morality can produce many interesting results. Additionally, as you choose a path for skill development, other physical changes occur. If you decide to focus on melee attacks and improve your strength, your character becomes more burly and mannish. Improving your shooting accuracy increases your height, and learning magic causes your character to become covered with glowing blue tattoos. What I find most disturbing in all of this is that morality in Fable II is legibly written in the shape and color of the digital body. Actions and appearance are made synonymous. An evil character looks evil and a good character looks good. If you appear sinister, it’s because you’ve done terrible things like sacrifice people at the Temple of Shadows. If you appear pure it’s because you’ve been rescuing slaves and charging your tenants fair prices. In this game, therefore, judging someone based on their looks is no different from judging them on their actions. If you are good and pure, you will develop handsome Aryan features. Brown skin is associated with corruption and demonism. Light skin is associated with purity. Correct me if I’m wrong, but isn’t this racism? In my mind, not only is this game racist, it provides a tacit justification for racism. I don’t think that the designers of this game intended to make it racist. This is another iteration of a much older and deeper cultural prejudice—a Western tradition in which angels are white and evil has black skin. In The Lion King, the evil lion Scar has much darker fur than all of the good lions. It’s the same sort of thing. There is no divide between body and self in the Fable II hero; what you look like is who you are. By equating body and self, Fable II brings the player’s conception of her body to the front of her mind. It invites you to wonder: what does your body say about your actions and morality? What character traits are readable in the human form?